Edited by the innocent fool, 25 January 2008 - 01:20 AM. I am putting up 2 screen shots of my IE7 during full screen mode ....... ... this one's when neither of the buttons or the address bar appears and ..... this one's when the buttons and the bar appears ..... I think the diiference between the full screen and the normal mode will be the "blue" part (just above the address bar which disappears on full mode) and 'minimize', 'maximize' and 'close' buttons (which on full mode appear alongside the search bar, instead of appearing on the "blue" part). Hi paws, I did as u told me to .Windows Update worked fine, though none of the updates helped my IE7 problem .Also, uninstalling and installing again only brought back the "Startup was unable to install the latest ..... " message all over again ... sigh .... in short, I am still stuck with the same problem. Answering your other question,my Windows XP had become very slow and used to hang up or freeze a lot about 6 months back. As I had hardly any knowledge about computers back then and didnt know what to do, dad asked our vendor to help us. He took our computer and a week later he returned it with a new user account. He showed us the new user and said it worked fine. So my XP now had 2 user accounts and of course, later I realized the old user continued with the same problems. 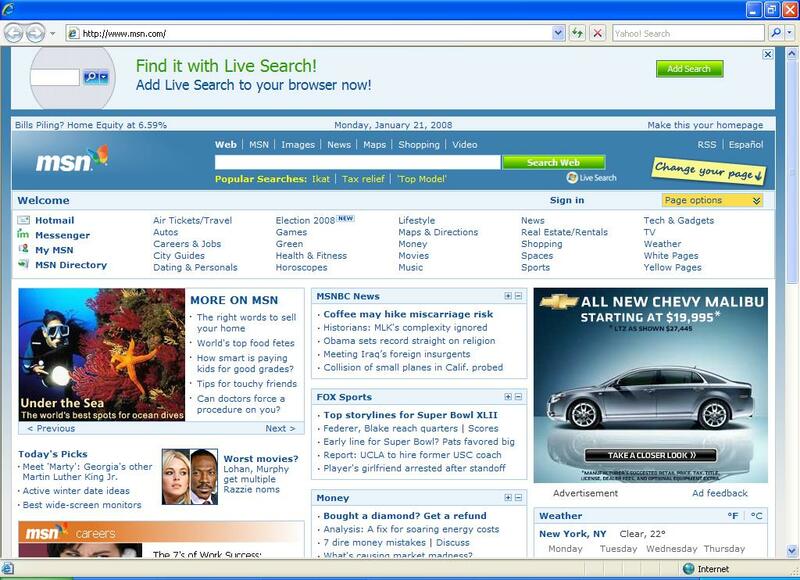 I also noticed that he had changed the Internet Explorer version from IE7 to IE6. (I had installed IE7 back then which was working fine).But since the original problems were never solved, I asked one of my friends who has better knowledge about computers to help me out. He installed some of the softwares like Registry Mechanic, Ccleaner, antivirus etc and he also ran disk defragmenter, scandisk etc. 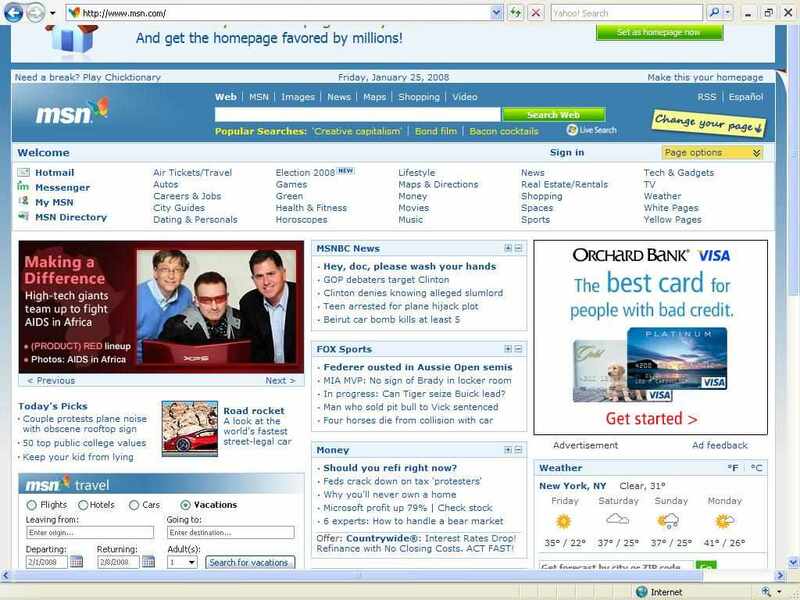 Now my windows was working fine without any problems and so we decided to install IE7 again. And thats when this problem started. He didnt know what to do and I cant trust my vendor anymore. I am not sure whether the whole story is relevant but I am hoping that it will give u a better idea about my problem and you can come up with a solution Thanks for your concern. download a IE7 to your desktop. uninstall IE7. Download the lastest version in the green box to the right. Reboot and enter safe mode. To reboot and enter safe mode : Hit F8 right after first bios screen, just tap it till you reach the black boot screen. Select safe mode without network. Now install the IE7 which you downloaded to your desktop, and reboot. Tell me afterwards how it went. Edited by Abydos, 26 January 2008 - 10:24 AM. Hi Abydos thanks for your reply . I did exactly as u said. downloaded the file to the desktop. uninstalled IE7. and then installed IE7 in safe mode. Unfortunately the same message("Setup was unable to install the latest Windows .........) appeared in the safe mode too. The problem persists. thanks for your reply . I did exactly as u said. downloaded the file to the desktop. uninstalled IE7. and then installed IE7 in safe mode. Unfortunately the same message("Setup was unable to install the latest Windows .........) appeared in the safe mode too. The problem persists. Do you have problems with other updates as well, or is it only IE7? Could you by accident have denied access to the net for SVChost.exe via your firewall? You did remember to try update the new install after reboot right? Remember you was in safe mode without network. Hi Abydos, All my updates work fine. Its just IE7 that gives me the problem. The updates of IE7 worked fine too through Windows Update. yet I am facing the same problem. "Could you by accident have denied access to the net for SVChost.exe via your firewall?" I am not sure about that. If u can tell me how I could check that too .